Anyway, enough pictures and talk about Protoss… Let’s start cooking! Total prep time will be about 35 minutes. Total cook time will be roughly about 12 – 15 minutes. This will make 4 servings. Combine salt, pepper, turmeric, coriander, cumin, garlic, coconut milk, lemon grass, lime juice, and sriracha in a food processor (or blender). Pulse the mixture for a few seconds or until combined. Add your shelled shrimp into the food processor. You will want to add the shrimp in batches and process after each batch. Process until combined (it’s okay to leave larger shrimp chunks in the mix). Remove shrimp mixture from the food processor and place in a large bowl. Crack an egg into the shrimp mixture and combine. Add in chopped red pepper and some chopped cilantro. Divide the mixture into four parts. Take one each of the four sections and shape them into patties. Set patties aside. Set a large skillet on high heat and in 1/2 of your olive oil. Once your skillet becomes hot, place 2 patties in the skillet. Cook for about 3 minutes on each side, then reduce the heat to medium allow the patties to cook for an additional 2 minutes. Remove cooked patties and set aside. Repeat the previous step for the next two burgers. In a small bowl, combine coconut milk, salt, honey, sriracha, lime juice, and peanut butter. Stir to combine the mixture. If your sauce is too thick, add in a little bit more coconut milk. The sauce consistency should be similar to ranch dressing. 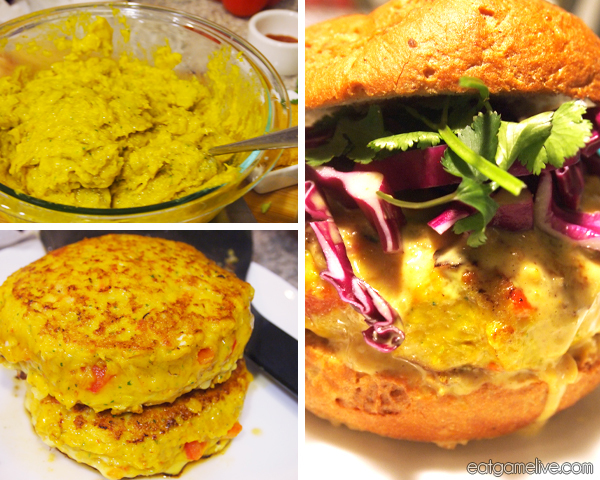 Place a spoonful of peanut sauce on bottom half of the hamburger bun. Place a shrimp patty on top of the peanut sauce. 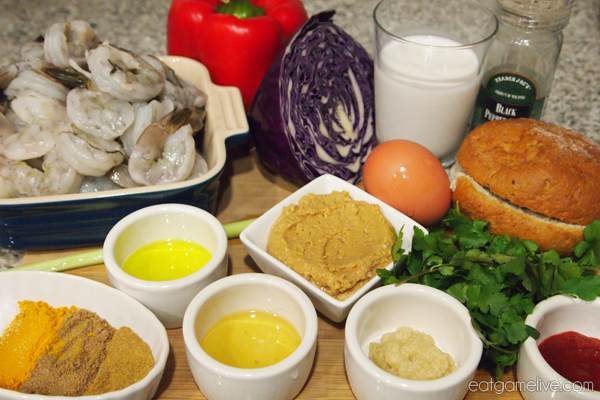 Place another spoonful of peanut sauce on top of the shrimp patty. Add shredded red cabbage and cilantro on top. 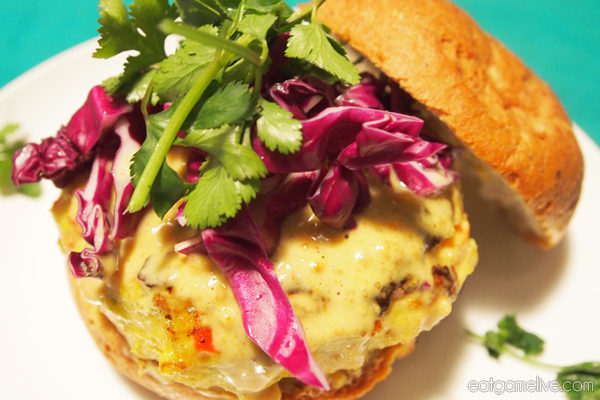 Finish by placing the top of the hamburger bun over the patty. And that’s a GG WP. My dinner for Aiur! 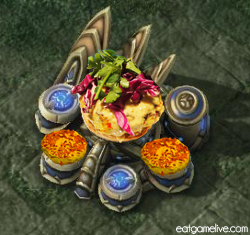 From my understanding, Protoss don’t eat food. That’s quite a shame because they’re missing out on these delicious burgers inspired by their own buildings. Oh well! Guess that just means more Cyburgnetics cores for Terran and Zerg. Om nom nom nom. 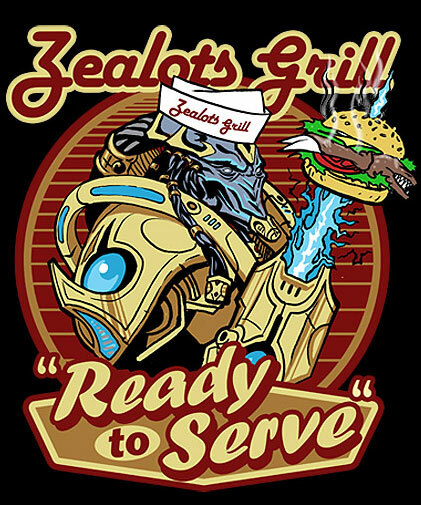 This entry was posted in sandwich, seafood, starcraft by admin. Bookmark the permalink.